Objective Vaping may increase the cytotoxic effects of e-cigarette liquid (ECL). We compared the effect of unvaped ECL to e-cigarette vapour condensate (ECVC) on alveolar macrophage (AM) function. Methods AMs were treated with ECVC and nicotine-free ECVC (nfECVC). AM viability, apoptosis, necrosis, cytokine, chemokine and protease release, reactive oxygen species (ROS) release and bacterial phagocytosis were assessed. Results Macrophage culture with ECL or ECVC resulted in a dose-dependent reduction in cell viability. ECVC was cytotoxic at lower concentrations than ECL and resulted in increased apoptosis and necrosis. nfECVC resulted in less cytotoxicity and apoptosis. Exposure of AMs to a sub-lethal 0.5% ECVC/nfECVC increased ROS production approximately 50-fold and significantly inhibited phagocytosis. Pan and class one isoform phosphoinositide 3 kinase inhibitors partially inhibited the effects of ECVC/nfECVC on macrophage viability and apoptosis. Secretion of interleukin 6, tumour necrosis factor α, CXCL-8, monocyte chemoattractant protein 1 and matrix metalloproteinase 9 was significantly increased following ECVC challenge. Treatment with the anti-oxidant N-acetyl-cysteine (NAC) ameliorated the cytotoxic effects of ECVC/nfECVC to levels not significantly different from baseline and restored phagocytic function. Conclusions ECVC is significantly more toxic to AMs than non-vaped ECL. Excessive production of ROS, inflammatory cytokines and chemokines induced by e-cigarette vapour may induce an inflammatory state in AMs within the lung that is partly dependent on nicotine. Inhibition of phagocytosis also suggests users may suffer from impaired bacterial clearance. While further research is needed to fully understand the effects of e-cigarette exposure in humans in vivo, we caution against the widely held opinion that e-cigarettes are safe. Do e-cigarettes have a negative impact on alveolar macrophage viability and function? Vapourised e-cigarette fluid is cytotoxic, pro-inflammatory and inhibits phagocytosis in alveolar macrophages. This work demonstrates a nicotine dependent and independent effect and also examines how these effects may be abrogated. Prior to vaping, ECL is composed of humectants such as vegetable glycerin (VG) and propylene glycol (PG) with or without nicotine. Several potentially cytotoxic metal and silicate particles are present in e-cigarette vapour equal to or exceeding the levels found in traditional cigarette smoke.5 6 Much of the current literature has focused on the effect of non-vapourised ECL or ECL condensate. However, such studies do not fully reflect the potential effect on an e-cigarette user as, importantly, the process of vaping itself causes changes in the chemical composition of ECL.7–11 Recently, some studies have attempted a more physiological approach using aqueous extract systems similar to those used to create traditional cigarette smoke extract (CSE),12 although this also results in considerable dilution. In vivo studies have also been carried out using whole animal aerosol exposure systems, without vaping, which have also predominantly focused on the effects on the lungs-.13 14 These studies showed exposure to unvaped fluid increased secretion of inflammatory markers, induced airway hyper-reactivity and caused lung tissue degradation in chronic exposure.13 14 These studies demonstrated the potential negative impact of e-cigarette fluid exposure, however the proven change in composition caused by the vaping process has not been factored in these models. Disturbances in AM function could therefore increase the risk of infection and enhance susceptibility to chronic obstructive pulmonary disease (COPD). We also assessed the effects of our ECVC with and without nicotine on human AMs to determine if this is a key component and determine whether anti-oxidants abrogate any of the effects. Detailed methods are provided in the online supplement. ECVC was prepared using a novel method employing six tracheal suction traps (Unomedical, Denmark) connected in series and cooled in a dry ice/methanol bath (see online supplementary figure E1a). We calculated the optimal puff duration of 3 s every 30 s based on published data.16–21 This allows time for the vapour to condense between each puff and prevented overheating of the device; 1.4 mL of ECL/nicotine-free ECL (nfECL) was vaped from each device. On completion, suction traps were normalised to room temperature and spun at 1500g for 10 min to collect the condensate. We chose a second-generation END, popular in the UK, to produce condensate (Kanger Ltd, Shenzhen, China; see online supplementary figure E1b). The devices were fitted with a standard 650 mAh battery with a fresh 1.8 Ohm coil head (atomiser) for each preparation. AMs from eight never smokers, five men and three women, with normal spirometry and no history of asthma/COPD were obtained by repeated saline lavage from non-affected lung resection specimens (see online supplement for full extraction methods). Gas chromatography–flame ionisation detector (GC-FID) assessment was performed by the University of Birmingham Chemistry Department to determine nicotine concentration. L-Nicotine standard (#10337220 Fisher Scientific, UK) was used as a reference standard for quantification. Viability was assessed using CellTiter 96 AQueous One Solution (Roche, UK). Apoptosis was assessed by flow cytometry using an Annexin V assay (BD Biosciences, UK) in combination with the vital dye propidium iodide (PI) (Sigma-Aldrich, UK). CXCL-8, interleukin (IL)-6, monocyte chemoattractant protein (MCP)-1, tumour necrosis factor (TNF)-α and matrix metalloproteinase (MMP)-9 levels in cell-free supernatants were quantified using commercially available ELISA kits (Biotechne, UK). Reactive oxygen species (ROS) were measured using DCFDA assay (Abcam ab113851) according to the manufacturer’s instructions. Phagocytosis assay was carried out using pHrodo Red Escherichia coli or Staphylococcus aureus BioParticles (Invitrogen, UK) according to the manufacturer’s instructions. Statistical analyses were performed using GraphPad PRISM 6.0 software package (San Diego, California, USA). Results are expressed as the median with IQR, unless specified otherwise. All results are representative of at least eight independent experiments performed in duplicate. Differences between multiple treatments were compared by the Kruskal–Wallis test followed by Dunn’s multiple comparison post-test correction. A P-value ≤0.05 was considered to represent a statistically significant difference. Detailed validation of our model of condensing vaped ECL is available in the online supplement (online supplementary figure E2). The model system proved both reliable and reproducible in terms of volume of recovery (60.8%), nicotine content (87%), as well as particulates (OD at 370 nm, table 1B). There was no significant variance in biological activity between each fresh preparation (online supplementary figure E2), however biological activity was lost over time with storage at −80°C (online supplementary figure E3, P<0.0001). AMs were exposed to ECL and ECVC for 24 hours, and produced a dos- dependent reduction in viability (figure 1). Unvaped ECL/nfECL effect on viability varied significantly compared with untreated control (UTC) following 2.5% (v/v) challenge (figure 1A, B): ECL: 78.8% viable (IQR 72.3%–87.6%, P<0.001), nfECL: 84.6% viable (IQR 83.9%–87.9%, P<0.001). Contrastingly ECVC/nfECVC produced a greater reduction in viability following a 0.8% (v/v) challenge (figure 1C, D): ECVC: 18.2% viable (IQR 15.7%–19.5%, P<0.001), nfECVC 62.8% viable (IQR 49.9%–68.1% p<0.0001) compared with UTC. Viability of AMs was maintained better in the nicotine-free challenge (nfECL/nfECVC), than that containing nicotine (figure 1A/C vs B/D), suggesting that although vaping significantly increases the cytotoxic potential of ECL, much of the cytotoxic effect was nicotine dependent. Effect of e-cigarette vapour condensate (ECVC) and -cigarette liquid (ECL) on alveolar macrophage viability. Viability was assessed by 4 hour incubation with cell titre aqueous assay following 24 hour exposure to a range of doses with (A) ECL, (B) nicotine-free ECL (nfECL), (C) ECVC, (D) nicotine-free ECVC (nfECVC). Graphs presented as median with IQR of eight independent experiments. The central horizontal line on each box plot represents the median, the upper and lower horizontal lines represent the first (Q1) and third (Q3) quartiles, respectively, and the vertical lines represent the range of values within the limits Q1–1.5 (Q3–Q1) and Q3–1.5 (Q3–Q1). n=8, *P<0.05, **P<0.01, ***P<0.001, ****P<0.0001. AMs were exposed to 0.8% ECVC/nfECVC for 24 hours and compared with UTC. After 24 hours the majority of cells remained viable; median: 92.5% (IQR 91.5%–96.9%, (Annexin–/Pi-), with low levels of apoptosis (Annexin +cells): 6.17% (IQR 2.63%–7.77%), and necrosis (Annexin–/PI+): 1.9% (IQR 1.7%–4.4%) (figure 2). Effect of e-cigarette vapour condensate (ECVC)/nicotine-free ECVC (nfECVC) on alveolar macrophage (AM) apoptosis and necrosis. Induction of apoptosis and necrosis in AM following a 24 hour exposure to 0.8% ECVC/nfECVC. Graphs presented as median with IQR of eight independent experiments. The central horizontal line on each box plot represents the median, the upper and lower horizontal lines represent the first (Q1) and third (Q3) quartiles, respectively, and the vertical lines represent the range of values within the limits Q1–1.5 (Q3–Q1) and Q3–1.5 (Q3–Q1). n=8, *P<0.05, **P<0.01, ***P<0.001, ****P<0.0001. UTC, untreated control. After 24 hours, total viable cells were significantly reduced when treated with either ECVC (40.87% alive, IQR 39.29%–45.61%, P<0.0001) or nfECVC (77.94% alive, IQR 73.09%–78.69%, P<0.01) compared with UTC. ECVC treatment induced significantly more apoptosis than nfECVC (17.4%, IQR 13.3%–19.4%, P<0.0001) and resulted in a greater total loss of viable cells after 24 hours of treatment (P<0.0001). These data confirm the cytotoxic effects of ECVC and support both a nicotine-dependent and nicotine-independent effect. The effects of sub-lethal ECVC exposure were assessed using measures of macrophage function important in the innate immune response, namely ROS production, cytokine, chemokine and protease release, as well as bacterial (Escherichia coli and Staphylococcus aureus) phagocytosis. ROS production was assessed following exposure of AMs to a sub-cytotoxic dose (0.5%) of ECVC/nfECVC for 4 hours. Untreated macrophages showed a low baseline level of ROS production (figure 3) (1085, IQR 863.7–1133 relative fluorescence units (RFUs)). Condensate challenge resulted in a 50-fold increase in ROS production for both ECVC (53 858, IQR 48 375–56 425 RFU, P<0.0001) and nfECVC (48 746, IQR 44 238–56 063 RFU, P<0.0001) compared with UTC. Functional effects of e-cigarette vapour condensate (ECVC)/nicotine-free ECVC (nfECVC) exposure to alveloar macrophages (AMs) on reactive oxygen species (ROS). AMs were exposed to 0.5% ECVC/nfECVC for 4 hours. Following this, production of ROS was assessed by DCFDA assay. Graphs presented as median with IQR of eight independent experiments. The central horizontal line on each box plot represents the median, the upper and lower horizontal lines represent the first (Q1) and third (Q3) quartiles, respectively, and the vertical lines represent the range of values within the limits Q1–1.5 (Q3–Q1) and Q3–1.5 (Q3–Q1). n=8, *P<0.05, **P<0.01, ***P<0.001, ****P<0.0001. The effects on pro-inflammatory cytokines, chemokines and metalloprotease production is shown in figure 4. 0.5% ECVC significantly induced production of all analytes: IL-6 (P<000.1), TNF-α (P<0.001), CXCL8 (P<0.0001), MCP-1 (P<0.01) and matrix metalloprotease 9 (MMP-9) (P<0.0001) compared with UTC. The response to nfECVC was more variable, with a lower increase in IL-6 (P<0.001), CXCL-8 (P<0.0001) and MMP-9 (P<0.0001) compared with UTC. Non-significant changes were also seen for TNF-α and MCP-1. Functional effects of e-cigarette vapour conensate (ECVC)/nicotine-free ECVC (nfECVC) exposure to alveolar macrophages (AMs). Production of inflammatory cytokines (A, B), chemokines (C, D) and (E) matrix metalloproteinase (MMP-9). AMs following 24 hour exposure to ECVC (0.5%) as assessed by ELISA. Data are presented as pg/106 live cells at the end of the experiment to account for cell loss. n=8, *P<0.05, **P<0.01, ***P<0.001, ****P<0.0001. Incubation of AMs with ECVC and nfECVC reduced pHrodo E. coli BioParticle phagocytosis by 30% (P<0.0001) and 50.2% respectively (P<0.0001, figure 5A). 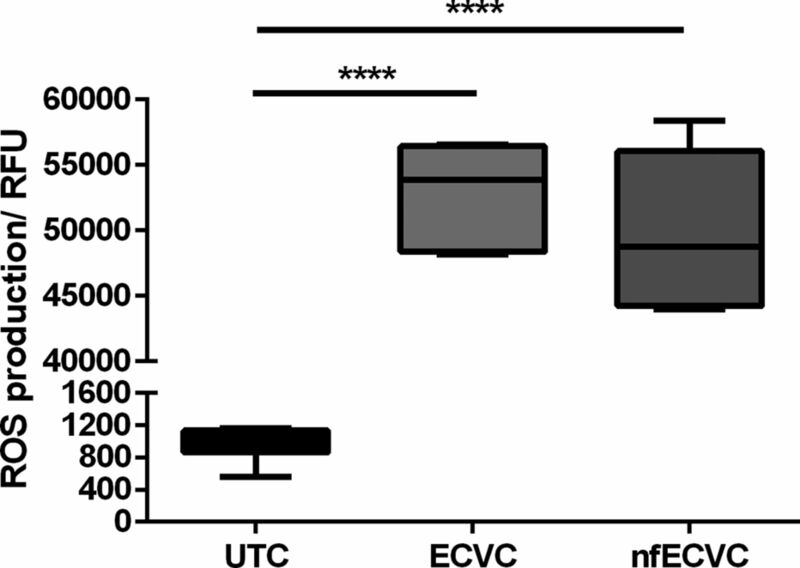 Functional effects of e-cigarette vapour condensate (ECVC)/nicotine-free ECVC (nfECVC) exposure to (A) alveolar macrophage (AM) and (B) THP-1 macrophage phagocytosis. Cells were exposed to 0.5% ECVC/nfECVC for 6 hours, following which uptake of pHrodo bioparticles was assessed. Graphs presented as median with IQR of eight independent experiments. The central horizontal line on each box plot represents the median, the upper and lower horizontal lines represent the first (Q1) and third (Q3) quartiles, respectively, and the vertical lines represent the range of values within the limits Q1–1.5 (Q3–Q1) and Q3–1.5 (Q3–Q1). n=8, *P<0.05, **P<0.01, ***P<0.001, ****P<0.0001. UTC, untreated control. Incubation of THP-1 macrophages with ECVC and nfECVC reduced pHrodo E. coli BioParticle phagocytosis by 41.7% (P<0.0001) and 48.5% respectively (P<0.0001, figure 5B). Incubation of THP-1 macrophages with ECVC and nfECVC reduced pHrodo S. aureus BioParticles phagocytosis by 60.9% (P<0.0001) and 62.9% respectively (P<0.0001, online supplementary figure E4). ROS production in response to cigarette smoking (or smoke extract) has been implicated as a mediator of adverse effects,23 therefore we examined the possible utility of N-acetyl cysteine (NAC) treatment in reducing the harmful effects of ECVC in THP-1 macrophages. Both AM and THP-1 macrophages were used for these experiments due to the large number of experimental conditions and numbers of cells required. Similar to our observations in AMs, ECVC and nfECVC were cytotoxic to THP-1-derived macrophages (24.4%, IQR 21.8%–27.4%, P<0.0001; 62.8%, IQR 54.4%–68.4%, P<0.0001, respectively(. 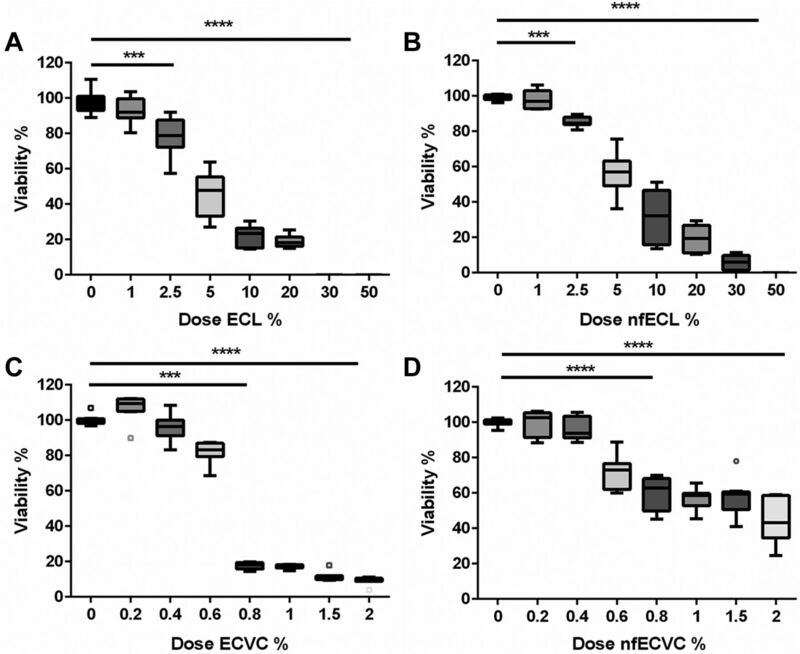 1 mM NAC treatment given simultaneously with condensate challenge prevented the effects on viability of both ECVC and nfECVC compared with UTC (figure 6A). Effect of antioxidant treatment on macrophages. (A) Viability following 24 hour exposure to e-cigarette vapour condensate (ECVC)/nicotine-free vapour condensate (nfECVC) in the presence or absence of N-acetyl cysteine (NAC). Graphs presented as median with IQR of eight independent experiments. (B) Apoptosis following 24 hour exposure to ECVC/nfECVC, in the presence or absence of NAC. Graphs presented as median with IQR of six independent experiments. The central horizontal line on each box plot represents the median, the upper and lower horizontal lines represent the first (Q1) and third (Q3) quartiles, respectively, and the vertical lines represent the range of values within the limits Q1–1.5 (Q3–Q1) and Q3–1.5 (Q3–Q1). n=8, *P<0.05, **P<0.01, ***P<0.001, ****P<0.0001. UTC, untreated control. ECVC challenge of THP-1 macrophages increased apoptosis to 36.1% (IQR 35.8%–39.8%, P<0.0001, figure 5B). 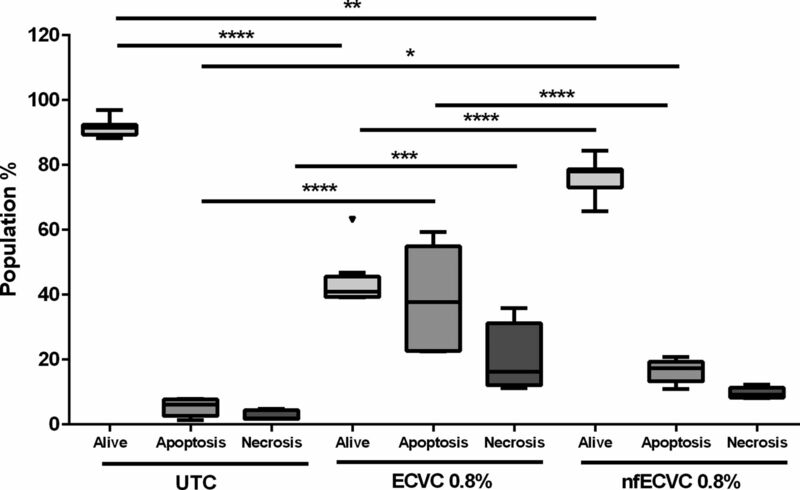 Exposure to nfECVC increased apoptosis to a lesser degree (18.8%, IQR 13.8%–20.2%, P<0.0001, figure 6B). NAC treatment given simultaneously with condensate challenge significantly reduced apoptosis in both ECVC (5.9%, IQR 4.6%–7.4%, P<0.0001) and nfECVC (4.5%, IQR 2.4%–4.6%, P<0.0001) challenged cells (figure 5B). Incubation of AMs with ECVC and nfECVC reduced pHrodo E. coli BioParticle phagocytosis (figure 6A). NAC (1 mM) given simultaneously with ECVC/nfECVC restored phagocytic function (P<0.001), although not to pretreatment levels (figure 7A). Functional effects of e-cigarette vapour condensate (ECVC)/nicotine-free vapour condensate (nfECVC) phagocytosis. (A) Alveolar macrophages (AMs) exposed to 0.5% ECVC/nfECVC for 6 hours in the presence or absence of 1 mM NAC treatment, following which uptake of pHrodo bioparticles was assessed. (B) THP-1 macrophages were exposed to 0.5% ECVC/nfECVC for 6 hours, in the presence or absence of 5 mM NAC treatment, following which uptake of pHrodo bioparticles was assessed. Graphs presented as median with IQR of eight independent experiments. The central horizontal line on each box plot represents the median, the upper and lower horizontal lines represent the first (Q1) and third (Q3) quartiles, respectively, and the vertical lines represent the range of values within the limits Q1–1.5 (Q3–Q1) and Q3–1.5 (Q3–Q1). n=8, *P<0.05, **P<0.01, ***P<0.001, ****P<0.0001. UTC, untreated control. Using THP-1 macrophages, an increased dose of NAC treatment was assessed to determine if a greater protective effect could be achieved. ECVC treatment reduced phagocytosis of E. coli pHrodo BioParticles by 41.9% (figure 6B, P<0.0001) and nfECVC by 48.4% (figure 7B, P<0.0001). Simultaneous treatment with NAC (5 mM) restored phagocytic function to levels comparable to the control (figure 6B, P<0.0001). Higher doses of NAC had an even greater restorative effect on cell function. ROS-induced lung inflammation in COPD has been reported to be associated with phosphopinositol 3 kinase (PI3K) activation.24 To explore a role for PI3K in ECVC-induced responses we used the pan- inhibitor LY294002 (5 nM) as well as an isoform selective inhibitor (PIK75 10 nM). Both general PI3K inhibition (online supplementary figure E5a) and PI3K α isoform inhibitor (PIK-75, figure 8) attenuated the effects of ECVC (Ly294002; 37.4%, PIK75; 35% increase in viability compared with ECVC, P<0.0001). This protective effect was also evident when cells were challenged with nfECVC (Ly294002 25%, PIK75 29.2% increase in viability compared with nfECVC, P<0.0001). PI3K inhibition was also shown to partially restore phagocytic capacity (online supplementary figure E6), after challenge with sub-cytotoxic levels of both ECVC (Ly294002; 21.3%, PIK75; 23.2% restoration compared with ECVC alone, P<0.005) and nfECVC (Ly294002; 25.8%, PIK75; 20.9% compared with nfECVC alone, P<0.005). Effect of e-cigarette vapour condensate (ECVC)/nicotine-free ECVC (nfECVC) and phosphopinositol 3 kinase (PI3K) inhibitor PIK-75 on alveolar macrophage viability. 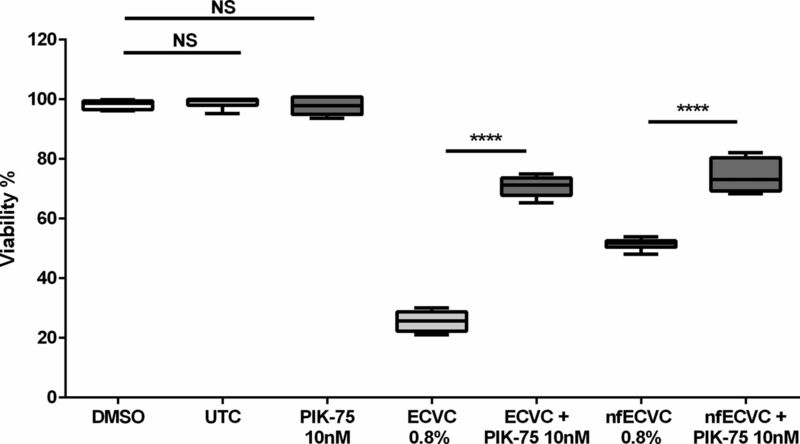 Viability was assessed by 4 hour incubation with cell titre aqueous assay following 24 hour exposure to class one specific PI3K inhibitor PIK-75 and challenged with ECVC or nfECVC (0.8%). Graphs presented as median with IQR of six independent experiments. The central horizontal line on each box plot represents the median, the upper and lower horizontal lines represent the first (Q1) and third (Q3) quartiles, respectively, and the vertical lines represent the range of values within the limits Q1–1.5 (Q3–Q1) and Q3–1.5 (Q3–Q1). n=8, *P<0.05, **P<0.01, ***P<0.001, ****P<0.0001. UTC, untreated control. We have validated a simple, cheap and effective system for condensing vaped ECL vapour to enable in vitro work. This is the first study to report human AM responses to ECVC and demonstrates dose-dependent cytotoxicity, inducing apoptosis with both nicotine dependent and independent responses which the vaping process accentuates. At sub-cytotoxic doses, ECVC enhances production of ROS, inflammatory cytokines, chemokines and metalloproteinases, although the response is less pronounced with nfECVC. Bacterial phagocytosis by macrophages is inhibited acutely by ECVC and the effects are attenuated by the anti-oxidant NAC, suggesting ROS and reactive aldehydes play a role in the effects of ECVC/nfECVC. These effects appear to be partially PI3K dependent. We have confirmed that vaping exaggerates the cytotoxic effects of ECL, inducing both cellular apoptosis and necrosis. These effects were seen when AMs were treated with both ECVC and nfECVC, suggesting both nicotine dependent and independent mechanisms. Several studies have examined the change in composition of e-cigarette vapour,2 3 7–11 and have identified many different chemicals that could be toxic, including free radicals, particulates, formaldehyde, nitrosamines, volatile organic compounds and polycyclic aromatic hydrocarbons.3 8 Importantly, the levels of several of these toxicants have been reported to be increased after vapourisation, due to heat and/or voltage generated by the battery in e-cigarettes.2 3 7–11 Many variables affect constituents of the vapour produced: the nicotine content, the ratio of humectants PG and VG present, the energy input used in the vapourising process, and the temperature achieved are all important factors. E-cigarette vapour has been reported to contain up to 7×1011 free radicals per puff.10 Both nicotine-free and nicotine-containing condensate induced a significant increase in ROS release from our AMs, which may explain the induction of apoptosis in nicotine-free liquid. There was significantly greater ROS production in AMs treated with nicotine-containing condensate than in nicotine-free condensate, once again suggesting both nicotine dependent and independent mechanisms at work. Consistent with our results, nicotine has been shown to increase ROS production in both epithelial cells25 and macrophages.26 A recent patient study by Reidel et al examined the protein content of induced sputum in e-cigarette users and smokers.27 In support of our findings, proteomic analysis showed significant upregulation of oxidative stress-related proteins in both smokers and vapers, such as MMP-9, known to be implicated in inflammatory lung diseases such as COPD. The effects of ECVC with and without were ameliorated by NAC and PI3K inhibition. Detection and phagocytosis of pathogens is key to macrophage function and in many cases is the first step in orchestrating an immune response to infection in the airways. Any effect of e-cigarette vapour on the phagocytic ability of AMs is therefore of potential significance to the innate immune response in vivo. At sub-cytotoxic levels both ECVC and nfECVC inhibited phagocytosis of E. coli and S. aureus, suggesting vaping might significantly impair bacterial clearance. Our data are supported by murine models in which mice exposed to e-cigarette vapour showed significantly impaired pulmonary bacterial clearance compared with air-exposed mice following an intranasal infection with Streptococcus pneumoniae. This defective bacterial clearance was due to reduced phagocytosis by AMs from e-cigarette vapour exposed mice.29 A recent human volunteer study30 found e-cigarette vapour significantly increased platelet-activating factor receptor (PAFR) expression, which aids pneumococcal adhesion to airway cells. In vitro PAFR is significantly upregulated by inducers of oxidative stress such as traditional cigarette smoke. Miyashita et al demonstrated increased PAFR leads to increased pneumococcal adhesion.30 A broader study also found risk of bronchitic symptoms was increased by almost twofold among e-cigarette users.31 These studies in human volunteers support our suggestion that e-cigarette usage may lead to increased or more serious respiratory tract infections, however further community-based studies will be required to fully assess the effect on lung health of e-cigarette users. Interestingly, in these experiments nfECVC produced a greater inhibitory effect than ECVC on phagocytosis. Activation of nicotinic acetylcholine receptors (nAChR) has been shown to upregulate phagocytosis in tissue-resident macrophages.32 Nicotine may therefore be offsetting some of the inhibitory effects in both ECVC and nfECVC, which are working through a nicotine-independent mechanism. Cytotoxic compounds generated during the vaping process,3 8 such as reactive aldehyde species—formaldehyde, acetyl aldehyde and acrolein—are known to induce apoptosis by lipid peroxidation.33 Reactive aldehydes further cause the accumulation of 4-hydroxynonenal (4-HNE) which can induce apoptosis via the Fas-mediated and P53-dependent pathways. HNE formation can also be caused by inflammation-induced ROS.34 35 With this in mind, we performed experiments using THP-1-derived macrophages challenged with a cytotoxic dose (0.8%) of ECVC/nfECVC in the presence and absence of NAC, a well characterised anti-oxidant and anti-aldehyde. NAC significantly attenuated both the cytotoxic activity and pro-apoptotic effects of condensate with or without nicotine. As shown with AMs, in THP-1 macrophages, ECVC caused significantly greater loss of viability and significantly more apoptosis than nfECVC, again suggesting a nicotine dependent and independent mechanism of action. Traditional cigarette smoking is implicated as the cause of COPD in at least 20% of smokers, which is characterised by increased neutrophilic inflammation and oxidative stress within the lung.24 36 37 The effects of oxidative stress in epithelial cells are mediated through micro-RNA34a via activation of PI3Kα.24 Micro-RNA34a has been implicated in accelerated cellular senescence, inducing a proliferative, apoptotic phenotype. These effects were aborogated by use of PI3K inhibitors restoring the baseline phenotype.24 Nicotine receptor seven is highly expressed on alveolar macrophages and its activation has also been shown to activate PI3K.38 39 We therefore examined the effects of pan PI3K inhibitor Ly294002 and class one isoform selective inhibitor PIK-75 on THP-1-derived macrophages. There was a significant protective effect after PI3K inhibition with Ly294002. This effect was mostly conserved when class one isoform inhibitor PIK-75 was used. PIK-75 selectively inhibits the p110α subunit 200-fold more potently than p110β subunit, suggesting a large portion of the activity is moderated through the class one isoform. However, further work remains to be carried out to fully elucidate the mechanism(s) of action of ECVC/nfECVC on AMs. Third, our model represents an acute exposure, rather than a chronic exposure system which is better suited to in vivo animal experiments. Fourth, there is currently a huge disparity in the literature regarding e-cigarettes. Many groups have championed the benign nature of ECL while others have shown the cytotoxic effects of ECL in vitro and in vivo. This disparity may reflect the lack of a standardised model of in vitro cellular exposure and interpretation. Therefore, until a gold standard is established, continued controversy is likely. However, our model seeks to replicate the actual exposure of the users’ AMs post vaping. We believe this is an important step in establishing an in vitro system by which to investigate the effects of e-cigarettes on the airways. Finally, we have not assessed the effects of flavours on cellular effects,43 partly because this adds another layer of uncertainty and potential confounders. However, the data provide a background on which to study these other potential factors, with and without nicotine. In conclusion, we sought to replicate the potential effects of exposure of the user in an acute in vitro system using our vaping-condensate technique. We show a significant increase in cytotoxicity caused by the vaping process itself. Importantly, exposure of macrophages to ECVC induced many of the same cellular and functional changes in AM function seen in cigarette smokers and patients with COPD. While further research is needed to fully understand the effects of e-cigarette exposure in humans in vivo, we suggest continued caution against the widely held opinion that e-cigarettes are safe.
. Induction of maturation in cultured human monocytic leukemia cells by a phorbol diester. Cancer Res 1982;42:1530–6.
. Pulmonary epithelium, cigarette smoke, and chronic obstructive pulmonary disease. Int J Chron Obstruct Pulmon Dis 2007;2:409–28.
. 3rd. Nicotine chemistry, metabolism, kinetics and biomarkers. Handb Exp Pharmacol 2009;192:29–60. Contributors Author Contributions: Concept and design: DRT, AS, STL, DD, KEL, BN, RF. Cell preparation, laboratory work and data analysis: AS, RM, STL, KA. GCFID- AB. Additional laboratory work: FSG. Patient recruitment: BN, DRT, DP, RM. Drafting manuscript: AS, DRT. ALL authors have read and approved the manuscript. Funding DRT (G1100196/1), ES (MR/L008335/1), AS (MR/L002736/1) and RM (MR/N021185/1) were funded by the MRC. AS, STL and DD were supported by the British Lung Foundation (PPRG16-12).